What happened to Aziza's favorite Frisbee? Is the girls' bathroom really haunted? Where is Mr. Greens, the teacher who disappeared? 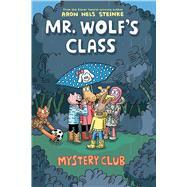 The three friends want to discover the answers together, so they start a mystery club! Meanwhile, Abdi has his own questions about what happens to the balls that are accidentally kicked over the fence during recess, and thinks he'll be a hero if he can find his best friend's football. Mysteries abound at Hazelwood Elementary! Aron Nels Steinke is the Eisner Award-winning coauthor (with Ariel Cohn) and illustrator of THE ZOO BOX. He’s a second- and third-grade teacher by day, and a cartoonist by night. He lives in Portland, Oregon, with his wife and son.